The 60’s came in with a bang with nothing but work, work, and more work. This was also the time of the cold war era with the Russians, with a lot of uncertainty and nuclear war was all too real. Relations with Russia soured when they shot down a U2 Reconnaissance spy plane over their territory and Russia building the Berlin Wall mainly to keep the Russian people from escaping. The Cuban missile crisis was very intense times, as well, with Russia moving nuclear missiles into Cuba that were within range of the United States borders. An incident that was not known to the American people until the fall of the Berlin wall was a secret Russian nuclear submarine called the K19 (The Widowmaker) was about 80 miles off the east coast of the US ready to let loose nuclear missiles into the US borders. However, that turned out to be a total disaster for the Russians because of a radiation leak from the nuclear reactor and coolant leak, which came close to a nuclear catastrophe. One of their own submarines eventually rescued them and towed the sub back to Russia. This incident did not become public until 28 years later during the years of Gorbachev. Then there was the assassination of President Kennedy by Lee Harvey Oswald on November 22, 1963 in Dallas, TX and situations happening in Vietnam pulled the US into a conflict with North Vietnam. These times also brought on a unique type of revolution of the people referred to as the flower child or Hippies, the experimentation of psychedelic drugs and the civil rights movements in the south, followed by lots of resistance to the current establishment. Despite all the turmoil around the world and within the US borders, the Marek Brothers saw phenomenal growth because Houston was a favorite destination. Many companies come and go over the years, but this company made good decisions even when faced with major difficulties and its employees wanted to see it succeed. It was a very employee orientated company where appreciation and respect meant something. During the 60’s the Marek Brothers saw growth rates of 10-15% and the facilities they were working out of on Blue Bell were getting insufficient. John L. was responsible for finding a more suitable place for the space they needed and a place where they could expand. At the time, they were storing their drywall at a different location and paying a royalty to a lumber dealer for the purchase of the drywall, since they were buying it by the train carloads. John L. came across the old Frank Sharp Lumber Yard in the Oak Forest area. The owner vacated and wanted to sell because he needed the cash. It was an excellent buy for $25,000. The company moved the materials' office to 2201 Judiway Street, in late 1960. With a more centralized location and larger facility, the advantages became very apparent. Marek Brothers incorporated Oak Forest Lumber and Supply Company on December 1961. The company tried to keep up with innovations and one that Ralph came across at a drywall contractor’s convention was a new product called “Aristex”. Aristex was a simulated acoustic material that was blown on the ceiling after the drywall was in place. Aristex was a product that was easy to apply, inexpensive to start out with, cuts down the noise, hides minor drywall finishing flaws, and gave the ceiling an attractive look. It became a success because of the ease of application and was suited for apartments. It eventually became a standard feature in the Houston apartment market. Another product that made the interiors more attractive was installing metal corners, which made the corners straight after completion of floating. In 1960, Wayne Vaughn, a leading California drywall contractor, called Ralph and suggested they meet to discuss the formation of a drywall contractors association in Houston. The association was affiliated with the Gypsum Drywall Contractors International, a national organization. 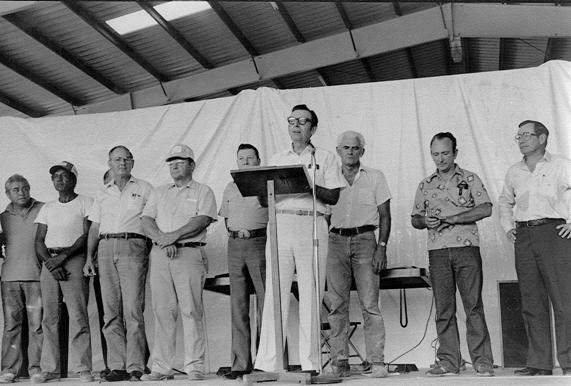 September 13, 1960 was their first meeting with approximately ten drywall contractors, a few suppliers, and Granville G Waggoner, the Past President of the Gypsum Drywall Contractors International. They saw many advantages of creating a chapter and benefits not only to themselves, but to the general population, as well. Over the years, the organization grew to become one of the largest chapters in the country, partly due to the dedicated involvement of the Marek Brothers Company. The housing boom during the 1960’s in Houston played a major role in fueling the Marek Brothers Company’s growth. The company was recognized as the largest residential drywall company in Houston. The commercial drywall business also saw a huge expansion that contributed to the growth of the company. Beginning the 1960’s, builders were starting to switch the interiors of the buildings from plaster to a gypsum board. Unlike the wooden framed homes, larger commercial buildings use reinforced metal frames. Another characteristic of commercial building is the use of union labor, which the Marek Brothers were not used to doing. Even though the Marek’s had no experience with commercial construction, they were the leading residential drywall company in Houston and had all the related experience and excellent contacts in the construction industry. The Marek’s could see the tremendous opportunities developing in the commercial industry that they could not let go by. In 1961, with the strong recommendations from Bill Marek, they decided that it was time to form a new company and created Commercial Drywall Incorporated (CDI). Initially, they operated as a joint venture with Siptak Drywall. The first joint project they worked on were office buildings for the Manned Space Center in Clear Lake. In 1963, a homebuilder J.B. Bone approached Bill Marek and asked him to handle the interior wall construction for a new movie theater, the Windsor Theater at Richmond and Loop 610. Bill initially protested that he did not know how to do this kind of work and Mr. Boone replied, “Then, find out”. It was a Cinerama Theater and the first project of its kind, consisted of curved walls and the ceilings. The architect, L.C. Kyburz of Beaumont, TX, paid particular attention to reducing fire hazards, improving the acoustics, and enhancing the overall aesthetic appeal of the theater. The Windsor Theater job was the beginning of the Marek brothers getting into the commercial side of the gypsum board and the use of metal studs, instead of the wooden studs that they typically used. This job ended up a success because of the help of Lodie Stapleton, who was a young system engineer and worked for Best Wall Gypsum, the company that supplied Marek Brothers with the gypsum board. He had a college degree having majored in Architecture and Civil Engineering from Texas A & M and thoroughly understood the construction industry. Having done a very good job on the Windsor Theater, Bill and Ralph Marek invited Lodie into Ralph’s office and invited him to run the new company, CDI. Although, flattered by the offer, he said he liked his current job. Ralph asked him what he was making and Lodie said $7,000. Ralph offered him $10,000, which Lodie could not turn down and accepted. The first six months were slow and Lodie worked with John L. on a housing development project in the Clear Lake area. Later that same year, they landed a contract in Austin, but with CDI using union labor that was on strike at the time, the job was a nice welcome. The entire CDI crew went to Austin to work on the project. Lodie’s brother, Shelly, had joined the company at this time to help on the project and then later his father joined, who had been operating his plastering business from CDI. After the Austin job, CDI started to grow more rapidly and by the end of 1967, they had completed work on the Chevron Oil Building, the Conroe Courthouse, Cameron Iron Works, Long Point Bank, Sam Houston Hospital, Globe Theater on Gessner, a six-story building on the West Loop, and the Almeda, Sharpstown, and Northwest malls. After working on different projects over the years, Lodie was a little concerned that no Marek family members were working for CDI, so Lodie convinced Ralph to let Stan and Bruce join the company. Stan graduated from college in 1969 from Texas A&M and spent six months active duty with the Marine Corp Reserve before joining CDI where he worked directly with Lodie. After Bruce had graduated from University of Houston in 1970, he began work with CDI working with Shelly Stapleton, who was then a field supervisor, assisting him with estimating and project management. By the end of the decade, CDI had become a well-respected and leading commercial drywall company. They had a good reputation of knowing what they were doing. During this time, CDI was small in comparison to the Marek Brothers Company, which focused on residential construction. One of the major issues during this time was being able to keep employees and try to lower the turnover rate that had been raising concerns for some time with the company. They initiated incentive bonuses to improve work quality with little effect. In 1966, the Marek’s implemented a retirement/pension plan to help with the turnover issue. Initially, $17,500 was invested in the plan and each employee received a $10,000 insurance policy. Another incentive was the profit sharing plan where at the end of the year, if there were any profits, a portion of it would go into an escrow account for the employee and they could draw it out when they reach 55. The employees would be fully vested within 10 years with the profit sharing plan and twenty years for the pension plan. The pension and profit sharing plan grew rapidly and did a great job of slowing down the turnover rate. In 1968, Marek Brothers Company accounted for 60% of the total profits, Stanley Construction accounted for 15%, CDI was having a slow steady growth accounting for 15%, and the rental income from the homes, which included Blue Bell Village accounted for 10% of the profits. At the end of 1968, there were 115 employees working for the company. At the beginning of 1969, business was slow, but then gained steam and turned out to be an excellent year. Since the company’s growth was strong, they could give employees frequent raises, even quarterly for some. In 1969, the average employee working for the Marek’s enjoyed 15-20% in raises in comparison to the national average of 6%.